What has been your favourite play? Brian: I really enjoyed Butcher. It was a tremendous production and has gone on to a good number of presentations in other cities. We got to see the play twice during it’s ATP run, including on opening night. It was very exciting to be exposed to such a successful new play; one which drew such strong gut responses from the audiences. We got to meet Nicolas Billon a couple of times when he was in Calgary and learned a lot from talking to him about his writing and the development of Butcher. Such a thrill to be closely connected to an amazing piece of new theatre! Susan: Yes, I also choose Butcher as a favourite. It’s great that it has now been performed so many other places, even Japan, to critical acclaims. Friends in Montreal saw it at the Centaur Theatre. Initially, I wasn’t sure if they would like it, but they thought it was brilliant! 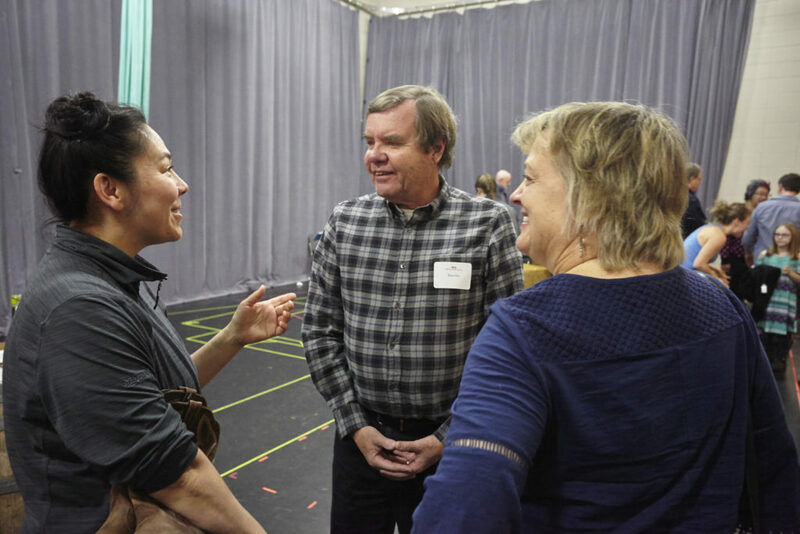 Brian Mills and Susan Tyrell with Actor Nadien Chu at an open rehearsal for ATP’s 2017 Holiday Show, E.B. White’s Charlotte’s Web. Photo by Jeff Yee. Do you have a favourite restaurant or meal in Calgary? Brian: Calgary has come a long way over the years in terms of presenting new dining experiences. We don’t eat out a great deal compared to some folks, and enjoy trying new restaurants. We always enjoy our food (and wine) at the Vin Room (in Mission). The menu featuring small plates provides a great chance to try a number of very tasty bites in a single visit. The wine selection is really nice too (and by the glass) and the staff is very friendly. Susan: Another favourite is Native Tongues. Do you have a favourite film or television series? Brian: We love watching Kim’s Convenience at the moment. Theatre Calgary put on a production of the play a few years back and we’ve been big fans ever since. It’s great to get a comedic view of life in Canada (or at least Toronto) through the eyes of a family of new Canadians and their friends/acquaintances. Susan: That and Schitt’s Creek are the only non-news-related shows we watch. Too busy taking in live theatre! Do you subscribe to any other performing arts companies in Calgary? Brian: Yes!! Theatre Calgary, The Shakespeare Company and Calgary Opera. We also very regularly attend performances at a number of other theatre companies, as well music and Nat. Geo. presentations at Arts Commons, and at the C.P.O. It’s often hard to choose what to do on any given night in Calgary! Susan: Thanks to [Executive Director of ATP] Vicki Stroich’s suggestion, we became Betty Mitchell passport holders, enabling us to vote in the Betty Mitchell Awards. At first, we thought attending a minimum of 25 plays would be a stretch, but every year we exceed that by more and more, and there are always some shows we’re interested in but can’t fit into our schedule. Theatre is addictive! Our musical tastes are quite broad and we attend the Folk Festival all day every day each summer, as well as classical, Jazz, folk, blues, and roots performances throughout the year. What is the most non-artistic thing about you? Brian: Outside of attending arts events and actively supporting the arts in various ways, I’m currently President of our Condo Board and have been a member of that Board for six years. Also I’m very active with the McGill Alumni Association in Calgary and just finished up a two-year term as President of that group. We are ardent walkers and get out for an hour or so pretty much every day exploring the City or wherever we happen to be at the time. Susan: Most things I do relate to the arts and culture in some way, like being a volunteer at the Calgary Public Library’s ESL Conversation Clubs, coaching newcomers in speaking English and learning about Canadian culture. My non-arts pastimes include Sudoku, and yoga, Pilates, and walking, but I believe there can be “art” in all human activity.